There’s just something about dumplings. Ravioli and tortellini, lamb dumplings, potstickers and gyoza, eggrolls, empanadas, even apple dumplings—why is it that stuffing anything inside a pocket of dough makes it seem so much better than the sum of its parts? 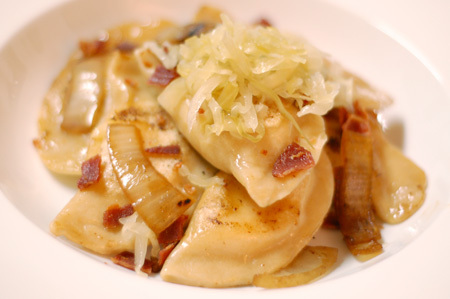 It may be my European roots showing, but I think my favorite dumpling of all time may be the humble pierogi. We had pierogi every so often when I was growing up, courtesy of the frozen food aisle. They were filled with potatoes and cheese and we cooked them in bacon fat, and they were crisp and chewy and creamy and salty-savory. I still like to keep an emergency stash of pierogi in my freezer to this day, but the difference is that now I make them myself. I wrote about this experience way back in 2008, when my son was just a few weeks old and I had a freezer full of handmade pierogi to pull out for quick meals, but at the time I wasn’t able to do the recipe full written justice. Time to remedy that, I think! I always make my pierogi with fresh dough that I run through my pasta machine. Once upon a time I rolled it into sheets and cut it with a biscuit cutter, but now I roll out snakes of dough, cut them into roughly 1″ chunks, and run them through my pasta machine, stopping at setting 3. Then I use my smallest disher to dose out the filling. As dumplings go, these have pretty basic shaping, and using fresh dough means no fiddling with water or egg washes to seal them up; maybe all that is why pierogi-making doesn’t seem quite as onerous to me as, say, potstickers or tortellini. It also helps that my recipe makes quite a few servings, enough to restock the freezer supply. Crack the egg into a measuring cup and beat it lightly; fill to the one-cup mark with water, then add oil. Place flour in the bowl of a stand mixer with the hook attachment; pour in liquid and knead with the hook until dough is smooth. Let it rest for about an hour. Divide dough into 1″ balls and roll out into approximately 4″ rounds. Place about a tablespoon of your chosen filling in the center, fold in half and pinch edges firmly to seal. Enough dough for 3-4 dozen pierogi, depending on their size; they can easily be frozen at this point. To cook fresh, drop a few at a time in boiling salted water; when they float, allow to cook for about 90 seconds more, then drain. Transfer to a hot skillet with some sizzling butter or bacon fat, and cook briefly until golden brown on each side. Serve with sauerkraut, bacon, sauted onions, and maybe sour cream. Add potatoes to pot of boiling salted water. Cook until soft. Mash, preferably with ricer, then stir in sour cream or yogurt and cheese. Season with salt and pepper. Source: Adapted from Jumbo Empanadas. Love dumplings. I have heard of the famous pierogi but have never tried them. These look so good. I best make myself some. I have got to try these. They sound wonderful, especially fried in bacon grease. I can just smell how good they are!!! Wonderful recipe for Pirogi. I had them growing up often and my mom would always made them…Thanks for sharing! btw great photo! Ohhh that looks so good. i haven’t had pierogi at any time in my life and this is actually the first time i’ve heard about it but your dish looks so rich, i’m so tempted to try it out. that looks so delish! I love the way you adapted the pierogi recipe from Jumbo Empenada’s blog. So yummy with the potato and cheese filling. I have not made pierogi in ages, now you inspire me to make it again, soon. Copied, and printed out the recipe. Great comfort food…these are the best, and you did an amazing job with it. mmmm..I love pierogi, they are really tasty, and yours look fantastic! Mmmm pierogies are delicious and yours look fantastic!